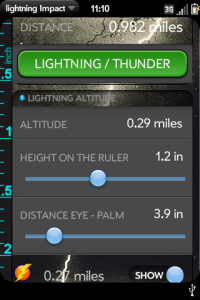 ScienceApps release today in a new version for “Lightning Impact”. 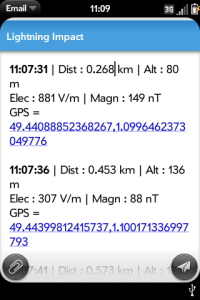 The app name changes to “GPS lightning Impact”. Create your own lightning impact map !!! 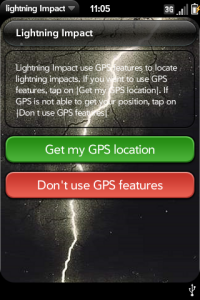 “GPS lightning impact” is an amazing app that allows you to locate lightning Impacts using GPS, in order to make your own lightning impact map around your location. – lightning impact count all over the world…. 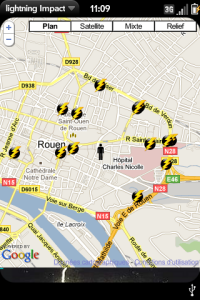 – Store all lightning impacts in a list then and create your own lightning impact map. – Export all your data by email to share with friends. Pretty neat app if you are into science. Could be cool if you could tag your location and maybe see areas with most frequent lightning. Keep up the good work developer! Very cool app for weather nerds! Keep ’em commin! 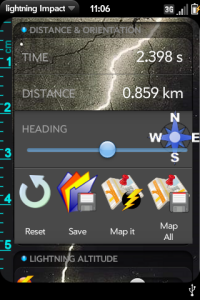 A fine app for storm chasers!!!! Nice to have an added layer of info out in the field. 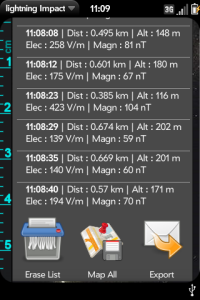 Not a good app for the average weather user who doesn’t understand the translation of the data to storms. Great app. Does what it says with lots of info, most people won’t care for that much info, but for storm chasers or weather geeks it’s awesome. Used promo code to test app on webOS2.1 pre2. Works perfectly! Great and useful app that any weather buffs or storm chaser must have!! Thanks Science Apps! Keep the apps and updates commin!! mise à jour très impressionnante ! bravo à toi pour ton boulot pour les apps webOS françaises. thank you fred ! heu… je veux dire merci !